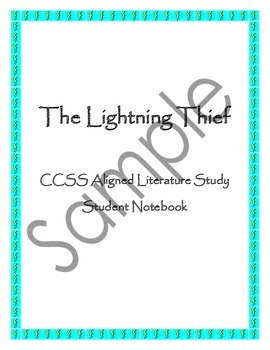 This is a literature study for Rick Riordin's The Lightning Thief. It contains a teacher guide and student notebook. The teacher guide includes teaching notes for each chapter as well as an answer guide for the student notebook. Activities in the student notebook directly align with Common Core ELA standards. 4th grade standards are listed with each task, but these can easily be adapted to 5th or 6th grade standards. Both Literature and Informational standards are addressed. The student guide also contains many of the myths that provide further background information to add a depth of understanding. My students have thoroughly enjoyed digging into this book and participating in the study.